Registration for the 2016 World Championships is upon us! Please join us November 2nd - 6th here in Roseville, MN to compete at the pinnacle of Fantasy Flight Games Organized Play. All of our supported games will crown a World Champion, who will earn the chance to cooperate with their game's developers to create a card for the game! Update (Friday 9/2 5:15 PM CDT): The last wave of Phase 2 ticket offers have been sent. Please check your inbox and spam folder. Update (Monday 8/29 4:30 PM CDT): A first wave of Phase 2 ticket offers have been sent. Please check your inbox and spam folder. Update (Friday 8/26 6:30 PM CDT): The second wave of ticket offers have been sent during Phase 1. Please check your inbox and spam folder. These ticket offers expire at 9:00 AM Central Time on Monday, August 29th. Update (Thursday 8/25 9:30 AM CDT): The first wave of ticket offers have been sent during Phase 1. Please check your inbox and spam folder. These ticket offers expire at 5:00 PM Central Time on Friday, August 25th. If any ticket offers are not claimed by their expiration, a second wave of Phase 1 emails will be sent to other eligible people if those offers were at random for that game due to limited remaining tickets. Please follow @FFGOP for further updates on Phase 1 tickets. Update (Friday 8/19 3:25 PM CDT): Re-confirmation emails were sent on Thursday 8/18, but many players have contacted us today asking about messages that they should have received for games they have registrations and payments for. Many players have also contacted us about messages they believe that they received in error, for games they know they did not successfully register and pay for. For that reason, we are sending another round of re-confirmation emails in the coming hours. The Constant Contact ticketing service captures the email addresses of unsuccessful registrations, and we believe many may have received the wrong email. So we will be contacting all players that successfully registered (through Constant Contact or Yapsody), and all players that did not successfully register (through Constant Contact). Please check your spam folder for these emails. Please only reference these new emails from August 19th for your records and our confirmation of your registration. If you receive your expected CONFIRMED emails tonight, no further action is required on your part. Note that you will not receive Not Registered emails for other events unless you tried to register for them unsuccessfully through Constant Contact. If you do not receive the expected CONFIRMED emails tonight, please check your spam folder, and then contact us at [email protected] to resolve any discrepancies. Please include any related documentation or payment details, other than the emails from Thursday 8/18. We will respond to these emails beginning on Monday, August 22nd. Thank you for your continued patience, and we look forward to beginning the offerings of remaining tickets next week (as detailed below). Please follow @FFGOP on Twitter for additional updates. Update (Tuesday 7/26 6:45 PM CDT): Thank you to everyone who assisted in our investigation of the service provider failures during World Championship registration by completing our short questionnaire before July 21st. After evaluating the responses we received, we have determined a course of action to help us account for the issues that many of our dedicated fans and players experienced. One last wave of ticketing was previously planned after the deadline for some champions to claim a reserved seat. These World Championship seats for each game, which would have been offered during that final wave of ticketing on August 19th, will instead be offered individually to the following groups from among those who responded to our questionnaire and indicated that they would be interested in another possible opportunity to register. Please note: When seats offered for purchase would not be sufficient to cover an entire group in the following priority order, random players from that group will be selected to receive the offers, until all seats are filled. Each game will follow this priority order individually, which may result in some games filling all of their seats earlier in the process than others. By August 18th: For each individual event, an email will be sent to each successfully registered participant to reconfirm their current enrollment. Players should email [email protected] beginning on August 19th if they have documentation or payment details for events that they do not receive this new email for. • Phase 1, August 22nd-26th: Players who did not successfully register for any World Championship event will be offered a chance to register for the event they designated as their primary interest. We want to include as many people as possible in this celebration of the game that they are most passionate about. With the ability to play in side events for other games, and a copy of each game's alternate art card being awarded as to each World Championship player, we believe this is the best first step to create enjoyable opportunities in abundance for the most participants. • Phase 2, August 29th-September 2nd: Players who successfully registered for a World Championship event, but did not successfully register for the event and game they designated as their primary interest, will be offered a chance to register for their primary interest event. We can understand the desire to participate alongside the global community for your favorite game, and want to make that a reality. However, we will not offer a player a seat during this round if their primary event has its preliminary rounds on the same day as an event that the player did successfully register for. • Phase 3, September 6th-14th: Remaining seats will be offered at random among those who indicated desire for additional games beyond those they successfully registered for, if any. If this phase is completed and seats still remain, they will be offered for public purchase at a coordinated time. Once we have included as many players as possible in the grandeur of the World Championship Weekend, we will begin to offer further registration opportunities to those who hoped to participate in additional games. Again, events which would overlap preliminary days with a player's previous registrations will not be offered. Reminder: Ticket refunds are not available after August 16th. All tickets purchased during these phases will be non-refundable. Updates will be provided through our Twitter account (@FFGOP) during the process, to confirm when an event has concluded its seat offerings. We realize that some players who did not successfully register for any event during the initial three waves, completed the short questionnaire, and indicated interest in another opportunity to register, may not be offered a seat for any games during any of these phases due to the limited space available. If a seat is not offered for any games whatsoever to someone who meets those qualifications (did not successfully register for any event during the initial three waves, completed the short questionnaire, and indicated interest in another opportunity to register), we will reserve a seat for that player for their primary interest game at the 2017 World Championships in early May for May Track games, or early November for November Track games. If they claim that reserved seat and attend that 2017 World Championship, we will also award them with a copy of their primary interest game's alternate art card from the 2016 event. Thank you for your patience and understanding during the tumultuous registration process. We shared your frustrations throughout the waves of ticketing, and apologize for the inconvenience caused by service provider failures. We hope that the process outlined above will help to account for the issues experienced. If you have any questions or further concerns during this process, please contact [email protected]. Please follow @FFGOP on Twitter for additional updates on 2016 World Championship registration. We are extremely excited to host this celebration of the communities for all of our Organized Play games! We hope to see you November 2nd - 6th! 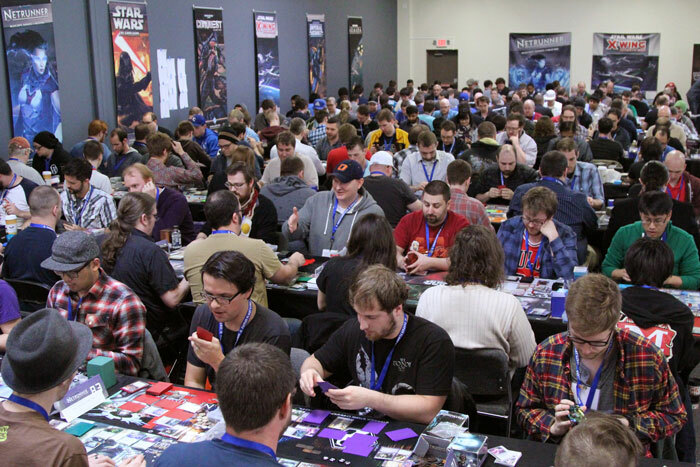 By participating in Organized Play at the local, regional, national, or global level, you connect to a worldwide gaming community. Make new friends, meet new opponents, learn new strategies, and play the games you love more often.